Saturday, March 19, 2016 — 7:30 p.m.
Handel’s Messiah originally debuted as an Easter work in the spring of 1742. This season, Praeclara continues and expands upon that tradition, presenting a bold new staging of the Messiah movements that focus on the suffering and the glorious mysteries of the Christian Holy Week. From the mournful opening chorus “Behold the Lamb of God” through the triumphant “Worthy is the Lamb,” a large choir of over 100 voices comments on the events of the passion and resurrection in conversation with a smaller choir of 18 elite singers. The lighting and movements of the soloists bring additional drama to this presentation, depicting the continuing struggle between darkness and light in the world. Fans of Praeclara’s Christmas 2014 production, Messiah by Candlelight, will find similar visual and musical artistry in this concert on an even grander scale. Featured soloists include sopranos Melanie Hanna, Elizabeth Riddick, and Kelly Singer; mezzo-sopranos Kathryne Overturf and Satia Spencer; tenors Matthew Tatus, James Wafford III, and Matt Newman; and baritone Jonathan Pillow. 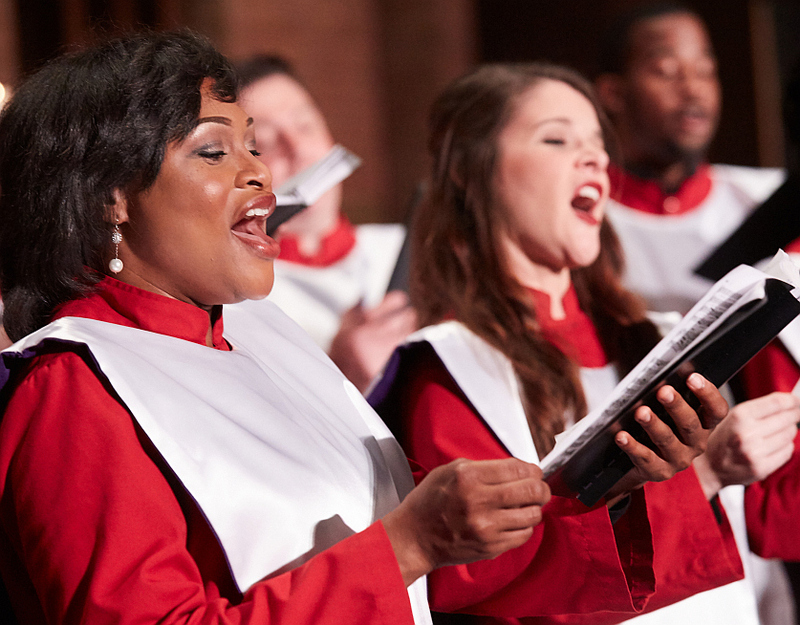 They are joined by members of the Praeclara vocal company, the Adult Choir of Second Presbyterian Church, the UALR Community Chorus, the UALR Concert Choir, and Praeclara’s elite hand bell ensemble, the Praeclara Ringers. Photo credits: Top, pictured from left to right: Kelly Singer, Kathryne Overturf, and Melanie Hanna; bottom: Elizabeth Riddick. Photography courtesy of Kelly Hicks.